This video is about the widespread hazards in the workplace that can cause infertility, miscarriage, stillbirth, birth defects and even childhood cancer. These dangers are examined from medical, legal and workplace health and safety perspectives in a concise and clear presentation. Health professionals: including doctors, nurses and public health officials who need to know more about the complex subject of physical, infectious and chemical agents that can adversely affect a patient's reproductive health. Health and Safety personnel: in companies and unions who are responsible for protecting the health of employees. Legal specialists: in corporations and unions as well as workers' representatives who need the latest information on liability and legal redress. Workers: in a wide variety of jobs and professions who need to learn about risks to their reproductive health. 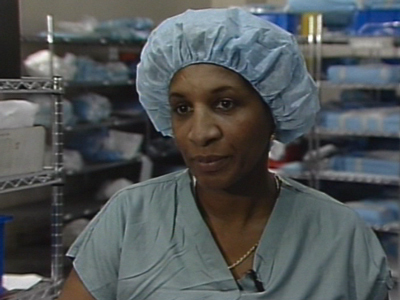 Dr. Maureen Paul -- and obstetrician/gynecologist and occupational health specialist. She is a professor at the University of Massachusetts Medical School and the director of the only clinic in the nation devoted to occupational and environmental reproductive health hazards. Nancy Gertner -- a prominent attorney, nationally known for her work on reproductive rights. In this presentation, she outlines the current state of law regarding reproductive health hazards and addresses corporate responsibility. Nellie Knight -- a supervisor of a hospital sterile processing department, received wide recognition when she transformed a workplace with serious potential hazards into a model of reproductive safety. What they say about "Hazardous Inheritance"
"An excellent video! The medical and legal issues are presented clearly and in a way that makes the information immediately useful to workers and union representatives. I recommend it highly."